Feelings are most of the time not really easy, are they? Particularly if there are so much of them. And then even more intense and different from usual. Then we have this list of feelings that we like and the others should stay away. But it does´nt work that way. Feelings are a really thrilling topic. They make us living, they make us alive. And even the „negative“ feelings can guide us. They help us. But we don´t like them anyway. I too. To be rational and effective – thats trendy. Everything else is annoying. Feelings really make everything chaotic. They have different rules, different priorities. We can not live as machines. It would not make us happy and no one else either. So we need to deal with the feelings. Many of us – so do I sometimes – try then if the feelings do not fit (into our plans) ignore them. But feelings do always fit (but never in our calender). They are the entrance to our authenticity and vitality. And therefore for joy and happiness, even if we may not feel really troubled or broken. It really brings more joy in our lives, if we accept our feelings and not fight them. Then we are easily able to feel the real happiness. The happiness about that we are simply right, and wonderful. Wild feelings show us (sometimes exaggerated so that they are easier to understand) really important life-topics. Topics we otherwise would ignore, because that´s easier. They can point us at ethical values, we might ignore and whitewash. Or they point us at old wounds, srong desires, big fears. All this is in inside ourselves and it is precious. It is part of our life. If we always don´t want to look at it, we cut ourselves from the power of solving these problems and learn and grow from them (and they continue hurting). If we really seriously love ourselves – and this is the most healthy state of being to seek, which brings ourselves and those around us happiness – then we need to love us when we are in a „bad mood“, too: not criticizing ourselves, not grumbling at ourselves, not being dissatisfied. Because then we make ourselves small and guilty instead of reckognizing the power which is in the situation. Being emotional is not an unpleasant side effect of pregnancy, no mistake of mother nature. It is important and necessary. It helps us, to deal with the radical psychic changes, it helps us navigating through this time, it helps us to became a mother. It helps us being open for this time of change and our still invisible child inside and enables us to love it. Simply dive in. Don´t worry, when we really dive into it, we really come back easily (and faster as if we don´t). Really. Promised. But how does this work: diving into it? It means you need to stop fighting, stop trying to be different, stop trying to feel different and stop being grumpy about feeling like that. You can comfort yourself and do something for you. But be careful that it is really something good and helpful and not simply flight or numbing. What is helpful and good for you? You can meditate, read inspiring texts that speak to your soul, take a bath, go for a walk. Express yourself through art, painting, writing, dance… Or listen to music and drink some tea… everything is healthy that lets room and is positive. Watching TV or reading novels is not on the list. You can give this as a reward to yourself but only after the first step. It is no confrontation with your feelings if you flee in a different life. Diving in is different from enduring. Enduring is, when you sit and wait that it will go away. That is one possibility to deal with and its not the worst. But its not diving in or confronting with the message and the power of the feeling. Thats why most people stay at the edge of the feelings. I really can understand this. I like to stay there, too. I too need to overcome my fears, to dive into the rough water. But it is worth it every single time. And the feelings loose their horror and show their sparkle and their power. I bet, you know this too: When everything is normal and fine, we so often loose our spiritual connection or stick at the surface of being. It´s quite normal that this happens over and over again. The clue is, to get back on track, every single time we noticed that we´v left. But Sometimes its hard.We don´t get back on track. We lost motivation, our pig dog won, or worst: We think its alright the way it is and everything is fine. We then really steal ourselves the satisfying experience of being deeply aligned with our soul and feeling a deeply connection and diving deep into lived wisdom and feeling really wonderful. In pregnancy this means we hold yourself from learning more about yourself, motherhood and our babys soul. And it means that we don´t allow yourself to receive healing. So very often we open up, wake up, when things get worse. But do we really want to learn every time from suffering? We don´t choose suffering – so when it happens, opening up and learning and committing to heal and nurture oneself is a good way to cope with a crisis. But we can learn without suffering too. We so often stick to the average, pretend that the barriers or the need of healing are there, don´t think of what we miss and steal from ourselves and in case of pregnancy what bunch of great experience we withhold from our baby, too. Because it really makes a difference if we are open and connected deeply (consciously curious) to the baby or not. It does not make sense to punish ourselves when we start realizing this or to become sad and crawl in a deep hole. The only thing we can really do helpful about this is: Accepting the truth and committing to change (There is the second option of keeping everything as it is, too – that is what fear is telling us – but this won´t make it better or make us happier). But, believe me, I know how hard this can be. How strong sometimes the fears or barriers feel. But believe me – this is an illusion. It is your own mind trying to keep your from growing because we always have fear of changing and growing. That is unfortunately normal. So if we really long to feel better, to receive healing, to change these things that are really get on our nerves we need to face the challenge with open eyes and commit ourselves to it. We all know this. So it´s time to DO it. P.S. 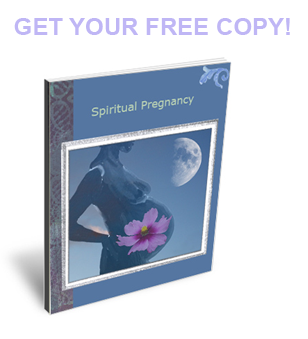 Pregnancy is the phase in life, where it is most easy to access the spiritual wisdom and experience with minimal fears and maximal motivation. So don´t let this possibility pass. 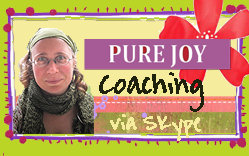 Let´s talk in the Birthcircle about the challenges and successes on the way. P.P.S. You know what: I wrote this article for me too, because I am stuck on the entrance of a healing change – and I really need to motivate me over and over to face the fears and the feeling of “its okay, you don´t have to do anything- don´t touch it”. But I know that I will be grateful forever, stepping into it. And so will you. 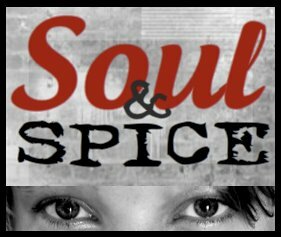 I blog about self-care, female spirituality, joyful living and joyful healthy spiritual pregnancy, childbirth and mothering. If you want to dive deep into your feelings. If you long to connect with others. If you wish emotional support. If you want to explore Pregnancy and Birth as a spiritual journey and initiation, your are warmly invited to join the sacred BirthCircle. Read more here. 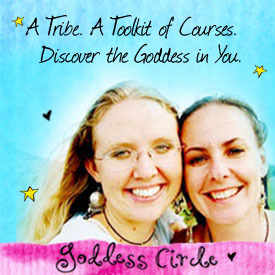 Get your free Goddess Goodies!